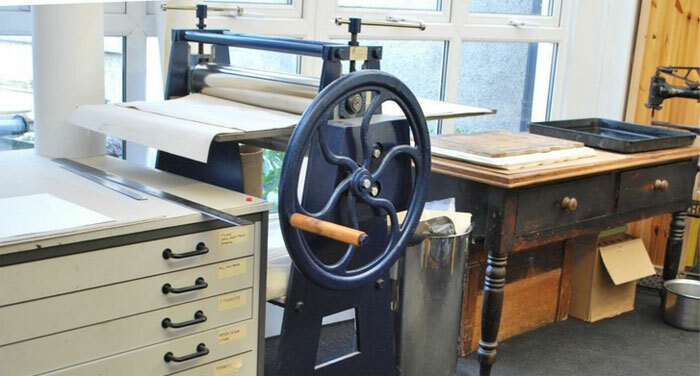 The printmaking studio is within Narberth town centre. Etching classes and courses are available – the studio has an etching press, an Albion relief printing press, as well as a good stock of etching and other print papers. Fridays weekly are professional practise open days. There is a studio charge of £10, paper and copper are charged separately. A maximum of 6 people will be able to work at any one time so please do call to arrange your day. Weekend print sessions/holidays can be arranged along with accommodation if required, presenting an opportunity to work directly with the beautiful Pembrokeshire landscape. Courses are run on demand – if you are interested in printmaking please get in touch.